Paw Print Genetics - Does Paw Print Genetics do Ichthyosis Testing? 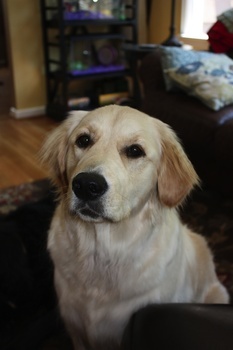 One of the genetic diseases most commonly tested for in Golden Retrievers is the skin disease, ichthyosis. Ichthyosis is an autosomal recessive disease occurring due to mutations in the PNPLA1 gene and can be seen as early as the first few weeks of life in affected animals (to be affected, dogs must carry two copies of the mutated gene, one from each parent). The prefix of the word, “ichthy-”, comes from the Greek word, “ikhthus”, meaning fish. This is in reference to the fish-like dermal scales that characterize this disease. Most commonly, dogs present with mild to severe generalized skin scaling of whitish scales that gradually give way to blackish-colored scales over time. The PNPLA1 gene mutation causes a problem in a process called skin cornification. Cornification is the process by which the body produces new skin cells that gradually move from the lower epidermis to the surface of the skin where they die and form the “hard” outer epidermis that functions as a barrier between the body and the environment. The surface of the skin is made up of dead cells that are bound together with protein and fats to form a “brick and mortar” arrangement. As these dead skin cells (corneocytes) shed from the body, more cells are created underneath and go through the same process of moving to the skin surface. In normal animals, skin cells will shed as single cells or in small groups. In dogs with ichthyosis, there appears to be either an increase in production of dead skin cells in the outer most skin layer (stratum corneum) or an inability of the body to normally shed the cells from this layer. In ichthyosis dogs, large sheets of cells shed together, thus creating the characteristic scales. Ichthyosis can be difficult to diagnose without skin biopsies due to close resemblance to allergic dermatitis and other skin conditions. However, in contrast to allergic disease, dogs with ichthyosis do not typically have inflamed or itchy skin, unless a secondary bacterial infection is also present (a relatively common occurrence in these dogs). In moderate to severe cases, management of ichthyosis can be a lifelong, time consuming (and occasionally expensive) endeavor best managed with frequent medicated baths and control of secondary infections. Thus, prevention through genetic testing before breeding the dogs is the most desirable and effective way of eliminating the disease. Unfortunately, ichthyosis does not appear to be rare. In a study by scientist, Anais Grall and others in 2012, it was quoted, “[Ichthyosis] has not been counter-selected and has thus rapidly spread throughout the breed with the frequency [of dogs having at least one copy] of the mutation now reaching 50%”. In a study by Marta Owczarek-Lipska and others in 2011, it was shown that the frequency of Swiss golden retrievers having at least one copy of the disease mutation was 71%. Given the exceptionally high disease frequency and inability to identify carriers by their appearance, it is incredibly difficult to pick an appropriate mate for your dog that can guarantee disease-free puppies. One method would be to maintain extensive pedigree information and prevent the breeding of dogs that have been shown to have affected offspring or grandchildren. However, a significant drawback is that this method requires disease information from multiple generations of both the dam’s and sire’s bloodlines. The other, more efficient and practical method to decrease frequency of this disease, is to genetically test the sire and dam for the causal mutation prior to breeding and then only breed normal or clear dogs to each other or breed a carrier to dogs clear of the mutation. Paw Print Genetics is currently the only laboratory in North America performing this test for Golden Retrievers. The team at Paw Print Genetics also provides genetic counseling services at no additional cost to ensure better genetic health for your puppies. Owczarek-Lipska M, Thomas A, Andre C, Holzer S, Leeb T. Haufigkeit von Gendefekten in ausgewahlten europaischen Retriever-Populationen. Schweizer Archiv fur Tierheilkunde. 2011:153(9):418-20. Grall A, Guaguère E, Planchais S, Grond S, Bourrat E, Hausser I, Hitte C, Le Gallo, M., Derbois C, Kim GJ, Lagoutte L, Degorce-Rubiales F, Radner FP, Thomas A, Küry S, Bensignor E, Fontaine J, Pin D, Zimmermann R, Zechner R, Lathrop M, Galibert F, André C, Fischer J. PNPLA1 mutations cause autosomal recessive congenital ichthyosis in golden retriever dogs and humans. Nat Genet. 2012 Jan 15;44(2):140-7. Photo courtesy of James and Catherine Kashork.